If you need more information, see Student Guide dealing with the simulator and two activities that use it--Rotating Sky and Motions of the Sun--at http://astro.unl.edu/naap/motion1/motion1.html. Make sure to note the lack of scale to students. This simulation is part of a larger lab that covers terrestrial coordinates and the celestial equatorial coordinate system, allowing users to explore the motion of the sun and how it relates to seasons. 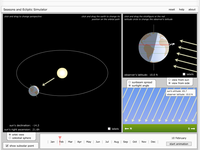 Comments from expert scientist: The resource gives a clear visual representation of the annual march of seasons and the plane of the ecliptic. The most helpful aspect is that the student can change the observer latitude to the latitude of interest, and select the date on the timeline. The angle of sunlight is also a useful way to visualize a concept that is often taught in a more static way. I assume that when teaching with this resource, instructors would give clear instructions, but at first glance it was not immediately obvious to me that you could drag the observer to change the latitude of observation. The simulator and short investigations that are part of the lab may help users appreciate the complex dynamics of Earth's orbit as an important aspect of understanding Earth's climate. Easy-to-use, intuitive simulation that, with minimal guidance, can complement other activities around seasonal dynamics. Resource is an SWF file that opens with Internet Explorer and Edge; it does not open with Safari, Chrome, or Firefox. MS-PS3.A3:Temperature is a measure of the average kinetic energy of particles of matter. The relationship between the temperature and the total energy of a system depends on the types, states, and amounts of matter present. MS-P1.2:ask questions to identify and/or clarify evidence and/or the premise(s) of an argument. MS-P1.3:Ask questions to determine relationships between independent and dependent variables and relationships in models. MS-P1.4:Ask questions to clarify and/or refine a model, an explanation, or an engineering problem. MS-P1.5:Ask questions that require sufficient and appropriate empirical evidence to answer. MS-P1.6:Ask questions that can be investigated within the scope of the classroom, outdoor environment, and museums and other public facilities with available resources and, when appropriate, frame a hypothesis based on observations and scientific principles. MS-P1.7:Ask questions that challenge the premise(s) of an argument or the interpretation of a data set. MS-P2.2:Develop or modify a model— based on evidence – to match what happens if a variable or component of a system is changed. MS-P2.4:Develop and/or revise a model to show the relationships among variables, including those that are not observable but predict observable phenomena. MS-P2.6: Develop a model to describe unobservable mechanisms. MS-P2.7:Develop and/or use a model to generate data to test ideas about phenomena in natural or designed systems, including those representing inputs and outputs, and those at unobservable scales. HS-C1.2:Classifications or explanations used at one scale may fail or need revision when information from smaller or larger scales is introduced; thus requiring improved investigations and experiments.